♥Harness Your Enthusiasm Kittens, I know many of you, like me, are frightened to spend an arm and a leg on a pair of boots that sport monstrous embellishments for the sheer fact that you are frightened. Frightened that, once ostentatious decorations fall out of style – as they so often do – you will be stuck with a priceless pair of shoes that are, quite possibly, unwearable. Fear not! Like a caped crusader emerging out of the darkness comes The 2 Bandits. The brilliant idea of design duo Erica Chan and Tamar Wider, Bandits are fancy flourishes that one can add or remove from their footwear du jour to dress them up and put a pop of personality into place. Cast a splash of Southwest flavor to your ensemble by slipping the colorful Cherokee around the shaft of a pair of rustic riding boots; go glam with the sophisticated Sunday sitting front and center atop a cognac-hued boot; or channel your inner biker babe by sliding the harness-like Gold/Black Pair around the ankle of a motorcycle boot. Remember, these boots were made for walking…and impressing! ♥Glitter-ific! As a lover of all things sparkly, shimmery, and lustrous, I find it downright devastating that incorporating the lightest dusting of glitter into my daily make-up regimen evaded me until this very moment. All this time I have searched for a product that would provide a dewy, glistening glow about my cheekbones, around my eyes, and even over my shoulders, but never did glitter so much as cross my mind before discovering mark’s Crystal Shimmer Luminous Loose Powder. The sheer powder sits upon your skin in a very lightweight fashion, and catches the light in a way that makes you twinkle like the brightest star in the sky. It’s enough to have created an obsession within me, leading me to seek out even more glittering gems, including mark’s Twinklebelle, Sophistique Sheer Shimmer Body Creme, and Flavored Body Powder from Urban Decay. Ready to get glittery? ♥Stud Muffin It’s quite bizarre, I suppose. You can see the rings adorning my fingers from no less than twenty-feet away; yet when it comes to the baubles peeking from my ears, they’re practically invisible. Perhaps it has something to do with the accident I was mixed up in at the age of eight involving a barely there hoop earring and a Burger King playplace; an accident that left my earlobe unscathed yet in a state of throbbing pain. Since then I have cast all matter of hoops and danglers aside, regardless of how fetching their appearance is, and embraced studs and only studs. Not every stud will do, mind you. It’s essential to find ones that match each and every aspect of your personality. Elizabeth and James’ Pollen Earrings, for instance, correspond magically with my inner flashy femme fatale; my nature-loving naïveté simply can’t get enough of Juicy Couture’s Butterfly Stud Earrings; and the flower child in me instantly comes to life when Giles & Brother’s Rose Studs are part of the equation. Have you been suckered in by studs, dolls? Thanks to We ♥ It and The 2 Bandits for the pictures. Love this post. The 2 Bandits Rock. Love their stuff. This week I was smitten with my Siwy Jeans. I love this denim line. Also, the boyfriend cashmere cardi I made... Its been super freaking cold in South Florida the past few days. Erika... Have you used the mark shimmer? Do you know if it has talc? I love the idea of the glitter powder! And studs are my absolute favorite! They add a level of "classy-ness" to any outfit. Oh I am so ready to get glittery. Have a sparkly weekend sweetheart. Great picks, I love all of Elizabeth&James things. Great post! I had my stud caught on a lady's purse when I was in third grade. I rarely wear earrings now even though my husband gave me pearls one Christmas and danglers this past V-Day. Both beautiful but both got returned. I'm smitten with smokey eyes. I'm beginning to experiment with them just this week. Those chained boots are fantastic, darling! I will take those Rose Studs thank you very much! So elegant! I guess I am smitten by the fact that I am going to check out a waterfall in 30 degree weather. Being stuck in the house because of countless snow storms has really given me cabin fever. Time to switch it up a little. Have a great week Erika. I like the idea of adding something to your boots. It definitely switches things up. Is that you coming out of the cab? It totally should be love! Oh and those rose studs? Lovely, lovely, lovely! The flavored body powder sounds yummy and it glitters which is a plus. I want those 2 bandits brown boots! This week I was smitten with Brendan Benson...he put on a good show Wednesday night! aw. these boots are a wonderful idea!!! Bandits has my heart racing Erika darling. I think that my quite possibly be the best fashion idea ever! I am always smitten with sparkle :) Tory Burch shoes and anything Elizabeth and James are my current obsessions. Lovely. 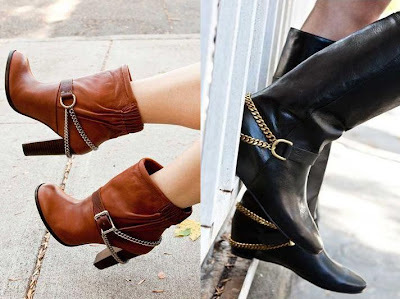 I love the idea of adding accessories to your boots! Its such a perfect idea! I'm tempted to buy everything from their store!! I'm kind of the opposite of you. I only wear dangly earrings or my usual giant silver hoop earrings. I think it's because I wear my hair down all the time and those are the type of earrings that you can see that way. Lol. Oh, Erika. You are just lovely. Happy Saturday! I agree, shimmer loose powder is a small way to twinkle. I wear it almost everyday, makes my mood instantly lift. I love the boot jewelry; I only wish it were a bit less expensive. I also tend to stick to studs (or nothing at all) for everyday. I LOVE necklaces and rings though, so big earrings would really lead to overkill! Thanks for tipping me off to these bee pollen beauties- love. I am a huge fan of anything cosmetic wise that glitters, shimmers, and glows! i will have to try the shimmer you recommended! it sounds perfect! Loving those boots as well! Ooh absolutely brilliant idea for the first one. Hmm what am I smitten with.... Scallop shorts, flowy dresses, & masqued balls! Great post. I love the rose earrings. love those boots, especially the brown one! Those rose studs are classic. Lovely boots too. The sun was out today..so some of the snow melted..but not much...shivers. i want those black boots! amazing post, as usual! I've been searching for a new pair of boots, something different, yet classic. i'm going to check out this 2 bandits site! thanks, miss lady! I am loving those brown boots! The Juicy butterfly earrings are to do for! Beautiful girl!